Our market system has evolved in line with capitalist philosophy, and at its heart is profit. But while profit can be a powerful motive, it is not always used responsibly and, in the worst cases, this can have damaging effects at a wider level. The calls for a corporate conscience grow louder, but no one has yet suggested an alternative to profit that people find as compelling. Profit is here and now. In this climate, the solution is to refine the profit motive, not replace it. We all value things, and we’re all motivated by what we value. If value could replace the profit motive, it would reconcile the interests of CEOs, shareholders, citizens and government. Profits would still rise but at the same time society would gain value. This book is a call to manage for maximum value – to follow The Value Motive. 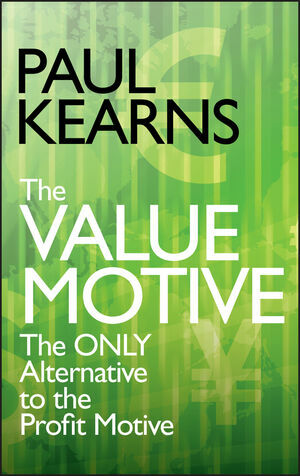 "In 'The Value Motive,' Paul Kearns clarifies the confusing concept of 'value' and shows how it can be used to transform thinking and action in organizations. Paul's books are always stimulating and controversial, and this one is no exception. If you are interested in creating more value in your organization and willing to have your existing mental models challenged, then you should read this book!" "I have worked with a host of HR professional over the years. To date I know of noone that compares to Paul when it comes to presenting the issues and challenges of managing human capital and providing practical approaches for doing so. Like his past books, The Value Motive, brings clarity to a world of HR, which often is filled with disarray and recommendations that tend to be driven by political correctness rather than by the intent to produce value. Paul's discussion of value as a driving force in organizations (in addition to profit) brings together the worlds of for and not for profit organizations. It also provides an overarching theme that includes the best interest of all stakeholders, customers, community and shareholders alike. This certainly represents a very much needed approach." "This is a timely, forward-looking, and convincing exposition delving into why value is a better determination of sustained ROI than profit. Paul provides simple, yet valid methodology regarding how much value is added by any organizational activity. His writings are a must for anyone measuring the true effectiveness of people development, an organization’s primary value-added activity." PAUL KEARNS started his career specializing in industrial relations management in 1978. He then moved into human resource management roles in engineering, construction and manufacturing businesses. His last corporate role in 1991 was sitting on the management team of an automotive business where he became acutely aware, for the first time, that managing value and managing profit were two entirely different objectives. He found, in particular, that managing the human aspects of organizations to create value had become probably the biggest management issue of modern times and one that had no easy solution and no single, coherent methodology. Since then he has been working in this field as a consultant, writer, teacher and business conference speaker. His writing has drawn a great deal of attention from both the business and academic worlds, although he has always regarded himself, first and foremost, as a pragmatic practitioner. As a consequence he regards his work as bridging the divide between academic theory and management practice. He teaches on MBA programmes and trains managers to understand the wealth creating opportunities presented by a more enlightened approach to people management. He has written eight books and is a regular, thought-provoking contributor to both academic and professional journals. Paul was born in 1955 in Leicester (UK) and has a degree in economics and economic history. He is married to Nuala and they have three grown-up children. Chapter 1. Profit is not a dirty word but value is much cleaner. Is profit the best way to allocate scarce resources? Profit can be a very emotive word. Not-for-profit? Does that mean not-for-value? Profit is an increasingly unpopular king. Chapter 2. Value - a very slippery word indeed. A working definition of value. Moving on to added value. Private equity partners - value adders or asset strippers? The value motive already exists..
Value as a distillation process. Declaring value in a public statement. A value statement for a commercial company. A value statement for a public sector organization. ‘Intangibles’ confuse the issue of added value. Chapter 3. This powerful, motive force we call value. Harnessing the power of motive. Value means output, not input. Defining value as an economic system. Does the capitalist system deliver the best value? When we say value we should really mean it. A holistic, value system for everyone. Chapter 4. Value has to be the raison d’être for every type of organization. Value is the raison d’être of all organizations. Corporate social responsibility (CSR) and the ‘triple’ bottom line. Is the public sector an obsolete construct? Chapter 5. Organizational performance measurement has to measure value. Turning human activity into value. The advent of the scorecard. The EFQM business excellence model. Agreeing value priorities using the 3 Box System. The gulf between performance measurement theory and practice. Activity, performance and added value measures. Taking a fresh perspective on the purpose of performance measurement. Chapter 6. Value is essentially a people thing. A fresh approach to people management. Measuring the value of people. De-bunking the employee-customer-profit chain theory. Replacing performance management with value management. Chapter 7. The people measurement ‘box’. People measurement is a really serious matter. Human capital management, a revolution in management thinking. People - are they personnel, human resources, assets or capital? Human capital measures and indicators of value. Chapter 8. How the value motive could upstage the profit king. The value motive is leadership. The politicians definition of value. The first, second and third sectors have to become one. Value special cases and dead losses. A new management discipline - valuing the human contribution.